Chandler, AZ, December 05, 2018 --(PR.com)-- MED-Fibers, Inc. announces the distribution of MED-Fibers, Inc. GrabHold™ Stone Basket with its Nitinol and tipless design allows for the positioning of the basket directly against the mucosal lining. This reduces bleeding and maintains a great and clear working field and reduced trauma. The user-friendly scissor style handle is easy to use and designed to keep the basket and stone within the focal range of the ureteroscope. Handle may be disconnected and reconnected with basket in place. The memory characteristics of the nitinol wire allows the basket to return to its original shape when the extractor is developed. 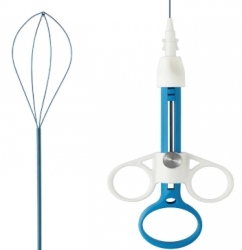 The flexibility of the baskets sheets allows you to fully deflect the ureteroscope during stone manipulation. GrabHold™ stone basket with scissor style handle is designed to reduce bleeding and trauma during kidney stone extraction. Click here to view the list of recent Press Releases from MED-Fibers, Inc.